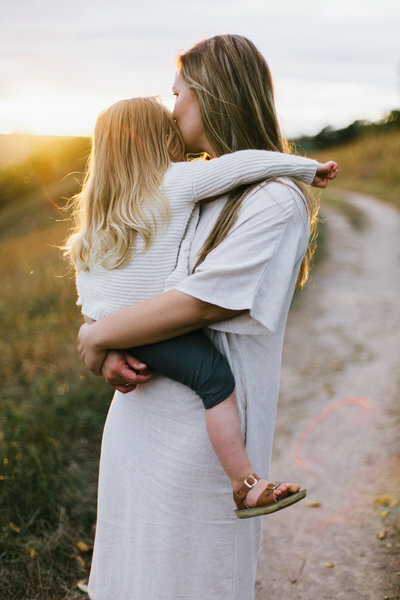 “My motherhood has been a story of grace upon grace and learning to trust the timing of things. My husband and I tried to have a baby right when we got married. Looking back, I think I was the baby, having just graduated college at 21, and I’m grateful it wasn’t the right time for us to get pregnant and that we got a few extra years to ourselves, to grow both individually and together before growing our family. We moved a bunch, across the country and changing careers before deciding to try again. When I had my first, I was in the thick of it – I had a difficult physical recovery and unexpected postpartum depression. I thought it would never end and that the rest of my life would be perpetually painful, physically and emotionally. But just like conceiving, the waiting and working through was worth it; I just needed the time. And even now, three years later, I’m learning that there is no “right way” to raising children or giving birth or getting pregnant, but there will always be ups and downs and phases and stages and regressions and growth. (And yes, the second time was a piece of cake in comparison!) It is all messy and miraculous, and my mission has just been to have the proper perspective about it all, that everything is a gift that I am grateful to steward.